Printing on paper, cardboard, PVC and paper stickers, plastic and acrylic sheets for light advertising, printing on PE and paper bags. Printing on coated steel or aluminiumm sheets - parts, stainless steel sheets, composite materials, for example dibond, plastic shapedmouldingss, advertising and promotional items. Finalization of offset printed materials - both partial and flat UV glossy and matte varnish, wiping colours, reflex and fluorescent colours, reprints of invitations, books, posters, calendars, etc. We use solvent-based, water-based and UV inks with excellent properties for deep stretching and with a long-term outdoor colour stability. Inks have a top effect in fluorescent tube light. Print with special effects - metallic effect, printing on transparent materials, two-sided stickers on glass, printing on reverse side of plates for light advertising, toning of colours according to delivered standards. 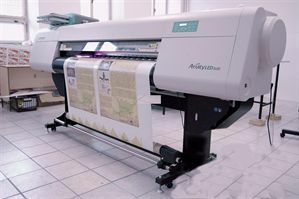 Raster printing with a high-resolution printing. Printing on floor graphics, including lamination of safety anti-slip foils. Partial and surface UV coating to B1 format. Special effects - toned UV varnish, relief UV varnish, metallic effects, matte UV varnish, anti-slip varnish. We have an equipment for round and cylindrical object printing - bottles, cups, etc. 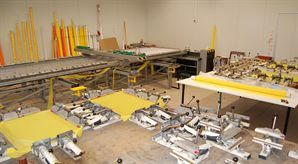 Manual screen printing equipment for print of small series and print of atypical semifinished products. • Full colour direct print on paper, cardboard, PVC stickers, banners, flag material, window graphics, floor graphics, lightbox, rollup, backlight. • Production of stickers for 2D and 3D applications – for complicated shaped objects, vehicles. We have an automatic and a hand operated carousel at disposal. We perform direct print on T-shirts, sweatshirts and other textiles, umbrellas, textile cuts and other materials. 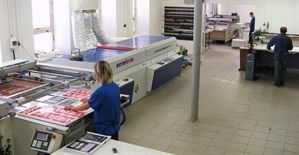 Production series from 1 piece up to thousand of pieces, daily capacity of 2 000 – 3 000 T-shirts or cuts with full-colour print. Max. print dimensions: width 330 x hight 450 mm, the possibility of atypical location of motives - sleeves, neck, bottoms hem. We use a process with plastisol, water-based, sublimated, two component, etching and transfer inks. We print with foamed inks, colourful and metallic glitters, phosphorescent, reflex and metallized shades and foamed transfers . We provide transfer print for colour demanding and precise details incl. applications on textiles or caps by the iron press, embroidery on textiles. We have a wide range of promotional textiles FRUIT OF THE LOOM and RUSSELL, for printing and embroidery. 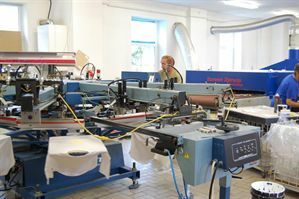 Of course, we print on textiles and materials supplied by the customer. For small series or on request, we alternatively use the cut flock or foil process including ironing. On request, we fold printed textiles, pack them individually in plastic bags and dispatched according to the logistics requirements of customers. Print on advertising and industrial three-dimensional items (pens, lighters, buttons) and various shape complicated objects. • Production of leaflets and posters to A0 format, stickers, folders, brochures, books and other printed materials, incl. all kinds of bookbindings, production of calendars based on customer requirements. • Lamination, embossing, stickers in sheets or rolls, custom manufacture of PE bags incl. full-colour prints, advertising flags and stands. • Production of packagings incl. full-colour prints - according to individual customer needs. • Development and production of gift packages incl. fixation of products. • According to logistic requirements, we provide preparation, packing and expedition of all print orders throughout the Czech Republic within 24 hours. • Personification of printed matters and packets. 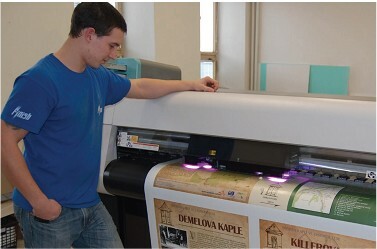 Print testing and technological preparation of printing orders for customers. Consulting services also with a visit of our expert at customer. We provide warranty and post – warranty service for machines and equipment sold by us. By agreement, we also provide service for machines that were not purchased in our company.